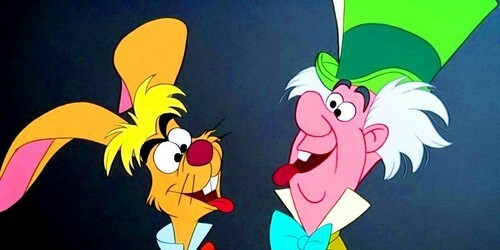 The March Hare & The Mad Hatter. . Wallpaper and background images in the Alice in Wonderland club tagged: alice in wonderland disney 1951 the march hare the mad hatter the march hare and the mad hatter header fan art. This Alice in Wonderland fan art contains anime, comic book, manga, and cartoon.